The Mid-American Conference was annually one of the best mid-major conferences in college basketball several years ago, consistently producing an NCAA Tournament threat with a couple of at-large possibilities. Last year did not have that, but featured an excellent conference race that came down to the season’s final day, when Kent State went into Akron and knocked off the Zips to finish 13-3, one game ahead of Akron. Central Michigan won the West Division title with a 9-7 record. The postseason brought nothing but madness. The top two seeds were upset in the quarterfinals, while No. 9 seed Ohio reached the title game and then knocked off No. 3 seed Akron. It didn’t end there, as Ohio went on to blow out Georgetown in the first round of the NCAA Tournament before losing to Tennessee. Will Ohio be on top from day one this year? 1. 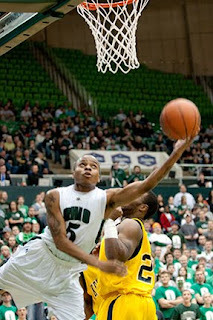 Ohio: The Bobcats hope last year’s momentum carries over to this season. D.J. Cooper runs the show, but he has plenty of weapons in shooters Tommy Freeman and Steven Coleman, and athletic forward DeVaughn Washington. 2. Akron: This ranking depends largely on the development of sophomore center Zeke Marshall. He combines with Brett McKnight to form a very good frontcourt duo. 3. Kent State: After a disappointing finish to last season, the Golden Flashes lost several key cogs. Guard Rodriquez Sherman and forward Justin Greene are a solid inside-outside tandem. 4. Miami (Ohio): Leading scorer Kenny Hayes is gone, but the Redhawks have some solid weapons back in center Julian Mavunga and guard Nick Winbush. 5. Bowling Green: The Falcons look to improve on last year’s last-place finish behind all-conference forward Scott Thomas and a deep perimeter group. 6. Buffalo: Six seniors – including the top five scorers – are gone from a team that had been competitive for a couple of years. Titus Robinson has to be reliable. 1. Ball State: With Jarrod Jones anchoring the interior and double-figure scorers Jauwan Scaife and Randy Davis on the perimeter, the Cardinals should pace the West. 2. Central Michigan: Three starters are gone from last year’s first-place team, but freshman Trey Ziegler is immediately one of the best players in the league. 3. Eastern Michigan: Forward Brandon Bowdry might be the most dominant player in the league, but he will need more help on the perimeter, namely JC transfer Darrell Lampley. 4. Western Michigan: David Kool had been the face of the Broncos for several years, but he is now gone. In his place will be all-conference forward Flenard Whitfield. 5. Northern Illinois: Former Colorado transfer Xavier Silas is the league’s top scorer, but he has little help offensively. Freshman Kyree Jones could help. 6. Toledo: The Rockets won just one game in the MAC last season, and only four overall. Moreover, three starters are gone. Justin Anyijong is the top returnee.